When Grade 2 students began learning about persuasive writing in class, their teacher Melanie Smith wanted the lesson to have a real-life context, so she asked students to write a letter to a real reader, to persuade them about a topic that students felt was important. A core principle of student inquiry within the Primary Years Programme (PYP) is that ideas come directly from students. Smith believes this is what makes the PYP such an exciting curriculum for both teachers and learners. So, Smith ’s students began by considering which issues mattered the most to them, raising topics such as the harmful effects of plastic in the ocean and the importance of wearing a helmet while cycling. They also considered persuading influential people who had the power to make real change, such as J.K. Rowling, Emma Watson and even Vladimir Putin. Smith felt that it was important to emphasise to students that even though they might not receive a reply, raising awareness of the issues was still very important. A popular choice among students was Dutch Prime Minister Mark Rutte, with four students writing directly to him. One of the students, Bo Gunning, had the opportunity to meet Mr Rutte to personally hand over her classmates’ letters. 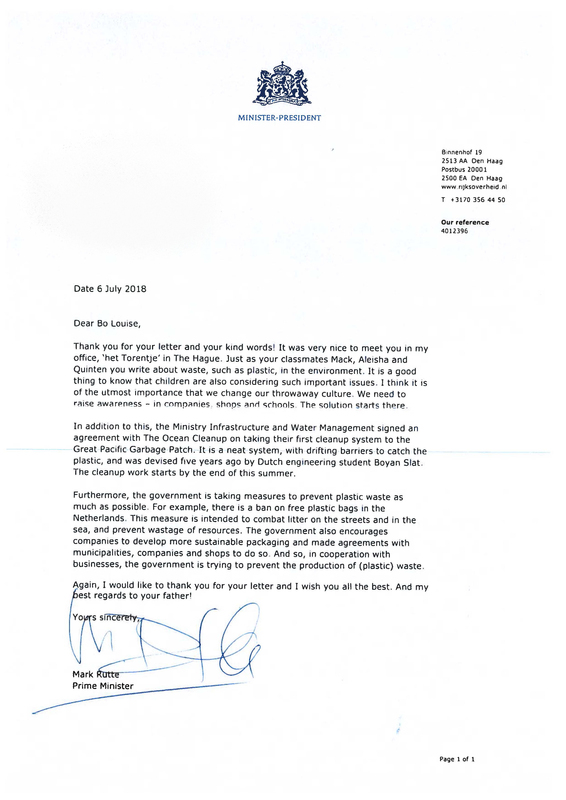 To the delight of the students, Mr Rutte replied to each of their letters, thanking them for raising awareness of their issues and explaining the actions he had taken. Grade 2 students were excited to receive their replies from Mr Rutte and are hoping that he will come by the school to visit them in person one day!